Shi-Mu, surnamed Sun, given name Su-Zhen and Ming-Shan, known as Hui-Ming in the Tao Temple, was born in Shan County, Shantong Province of China, on August 28, 1895. She has practiced good family teachings since childhood; and with her gentle and refined disposition, she developed virtuous character. As she received Tao in 1908, Shi-Mu mercifully made great vows to save the suffering world. In 1930, the Almighty ordained Shi-Zun and Shi-Mu with Heavenly Decree to propagate Tao. Since then, every righteous person, either male or female, has enjoyed equal opportunity to receive the precious Tao and to cultivate toward enlightenment. Buddhas and deities showed miraculous signs to confirm this Holy Mission. Realizing that the Heavenly Decree could not be disobeyed, Shi-Mu assumed her responsibility wholeheartedly to assist Shi-Zun with Tao affairs. In 1947, Shi-Zun's unexpected return to Heaven on the Mid-Autumn Festival left his countless disciples in deep grief. Shi-Mu continued the leadership and strived to stabilize Tao affairs. Moved by Shi-Mu's virtues, all the cultivators were determined to go on with their devotions to the holy enterprise. With the occupation of Mainland China by communists in 1949, Shi-Mu took refuge in Hong Kong. 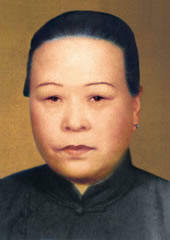 And in 1954, after resolving many difficulties, Han Lao Qian Ren invited Her to Taiwan, where she had settled ever since. With her utmost sincerity and compassion, obstacles and tribulations were overcome and misunderstandings were rectified. Tao propagation was legalized by the government and accepted by the public. Furthermore, Tao propagation was expanded from Taiwan to many foreign countries and thus earned tremendous reputation from their governments. At the age of 81, Shi-Mu passed away on February 23, 1975. The Almighty bestows her with the holy title of Zhong-Hua-Shen-Mu in honor of her great virtues.